[Devblog] Season format and Wild Realms FAQ part 2 - FORUM KROSMASTER : Forum dedicated to discussions about Krosmaster. Share all your opinions, ideas and tactical tips! In this devblog, [Nuuh] will talk about the Boss and Ban Lists changes for the Season format, as well as answering a few more questions about Wild Realms! Today, we are going to get started right away with what you have all been waiting for: the updated restriction list for the Season format. It's always a delicate time for us, with many expectations from player to player; nonetheless, we need to be decisive every time so we can offer a renewed, sound environment for the majority of players. Here are the changes, followed by a brief explanation. We wanted to keep the ban list as short as possible. Every time we ban a card, we stray further from this objective. She is part of the Base box. This is one of the obstacles that made it more difficult to ban her, since she is part of many players' toolboxes – especially for those with a small collection. Despite this, we decided to take this step in order to open up the metagame a little. Julith is a character who greatly restricts metagaming, in which she evolves while offering only a limited number of responses. Moreover, she has little interaction with her team, allowing her to be present in a wide range of teams. We also want to allow players of all levels to explore other possibilities so they can make the most of new content. We won't exclude the idea that once this period of exploration is over, we may remove Julith from the ban list. With Julith having been shelved, we prefer not to leave the door too open for Kitty to come back, so we are putting her back on the boss list. Lastly, we have chosen to add Phaeris to the boss list. His profile is highly effective against very strong profiles, and this provides an extra option for profiles that have not been tagged as bosses. The alternative that we would like to offer is therefore playing characters that are known to be effective, or playing characters who are slightly less effective, helped by Phaeris. We have heard people's worries about two new Krosmasters: Dragon Pig and Grougalorasalar. We are keeping a close eye on these two profiles in order to possibly add them to the boss list, but for the moment, we would prefer to let people use the season as they see fit and explore solutions for themselves. Now, let us move on to the second part of the FAQ: the Wild Realms. I've seen two questions doing the rounds on the forums and other social networks, and I think they need to be answered. The first one is regarding the keywords "Track" and "Invasion". In terms of game design, we chose to avoid the pitfall of adding additional effects that are partly dependent on these keywords. I can therefore confirm that all a spell's additional effects that have the keywords "Track" or "Invasion" are dependent on respecting the conditions relating to these keywords. 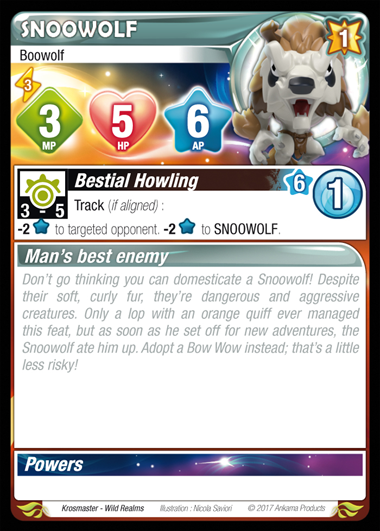 For example, if the Snoowolf casts its "Bestial Howling" spell, and it isn't aligned with its target; the spell is resolved without any additional effects. 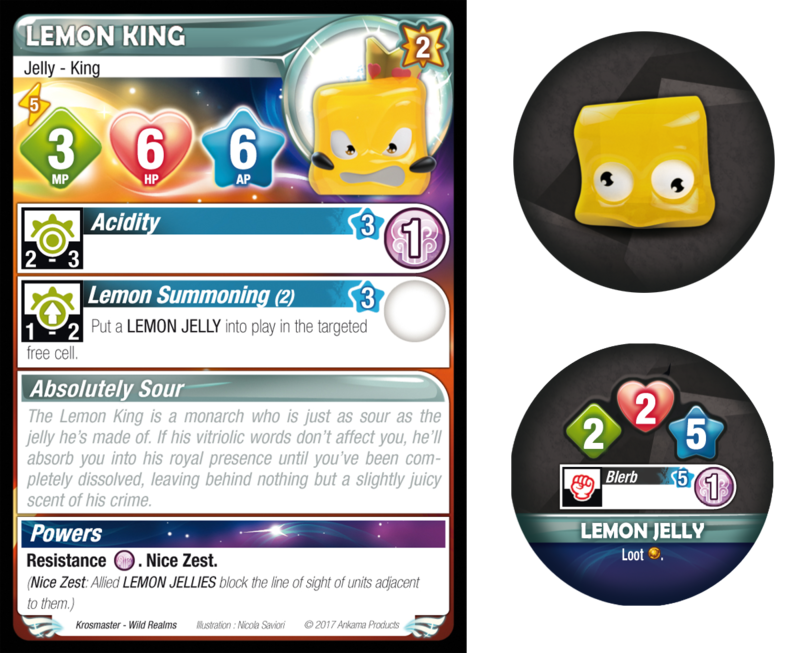 Now for a few more precise details about the Lemon King and, in particular, his "Nice Zest" power, relating to the Lemon Jelly, whose profile I'll give you a reminder of here. Here, it must be understood that for one unit, any line of sight that passes through the cell of a Lemon Jelly adjacent to it is blocked. There are two main reasons for having chosen not to use the "Obstructive" power to create this ability. Versions with "Obstructive" had a tendency to seem more verbose and complex than necessary, implying the notion of an active unit, or creating rule conflicts in terms of whether the "Obstructive" power was present or not. Next, less decisive, but a consequence that was quite convenient for us, was that Malee Buhrum – or any other Krosmaster – with a power close to Stain could therefore be constrained by Lemon Jellies. There we are: That's all for this week! I'll see you in two weeks, when we'll talk about the creation of Track and Invasion, among other things. There is little to no point in comparing a video game to Krosmaster. The former not only has a very different dynamic in terms of game-design and team building, but can allow itself to update several times per month. 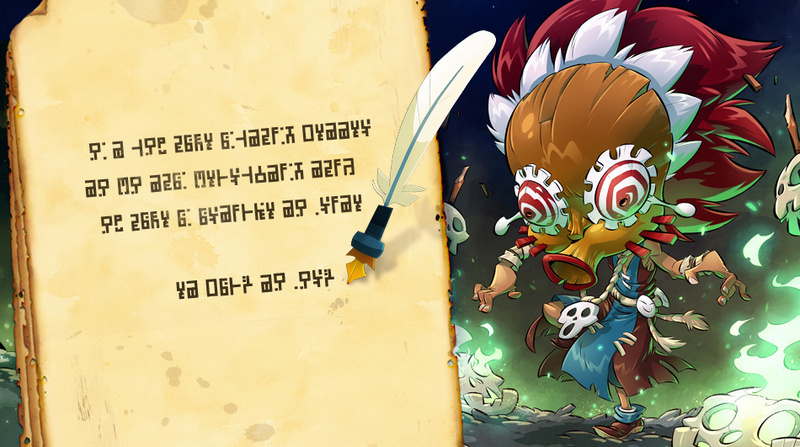 Krosmaster has a much lower rythm of release, physical restrictions to update the cards, and doesn't have as many little numbers that can be tweaked (switching from 5 to 6 initiative is a huge change, and let's not even talk about damage or level). Wouldn't it be better to change Unfazed once again (perhaps to "does nothing at all") instead of banning Julith altogether? Also with Phaeris and Kitty Rage as boss, seems a bit heavy handed.. not to mention miniatures such as Mador Thraki exist to help counter such miniature, or others like Vampyro. Thought truth be told, there's always the 5-6 level krosmaster teamed up with Julith, and it's very annoying. As for Kitty and Phaeris inclusion, very much deserved, specially for Phaeris, which should have happened earlier still! P.S. Will these rules be added to the beta or will we have to wait for the full version? The bans apply to the competitive part of the boardgame. They don't apply (so far) to the online version nor casual play. Likewise, changes on the profiles only occur online. That's what happened with Klor Ofil, banned in the boardgame tournaments, changed to lvl 4 (a.k.a. soft ban) online. The reason they can't ban models online probably has legal ramifications, since they are contractually bound to the fact the figurines sold up to season 4 have to be playable online (as is written on the packages). Wether one approves it or not, Ankama's policy so far has been to avoid micromanaging edits on the cards, except in cases where an errata was needed for game mechanics reasons (ex : Grougaloragran's spell's range). Game balance is managed solely through the boss and ban lists. Only when a set of profiles goes out of the Season format does an actual overhaul of the profiles occur, through the eternal decks. Dear Ankama - Please take a look at what League of Legends does. The On-line community will do a spectacular job of identifying OP figures and problem figures. USE THEM. LOL does frequent updates, the majority of which is to balance Characters. You could do this (On-line), until a good balance is reached, and then you could release the "Eternal Version" of REBALANCED AND TESTED figures. In this way there would be no need to BAN any figures or make frequent BOSS list changes. (NOTE - Boss list changes ARE in fact changes to the printed Card Attributes of figures. As soon as a Boss list change is made the cards can no longer be solely consulted for team building. So why are you guys so opposed to making changes to stats. Here is the thing, you've gone to a lot of effort both in the on-line and in the live figure versions of this game to put out a game with tremendously high quality assets. The figure design and asthetics of this game are second to none. (Both on-line and the physical figures) So why do you let your bad balance issues ruin game play. Julith has been a problem for what? A year now? She has been ruining the on-line diversity of play for a year. You let that continue to drive away players. That was a HUGE mistake. And banning figures is not the answer. Julith shold have been tweeked as soon as it was noticed she was dominating on-line play. I assure you what will make or break a game is "How fun it is to play", and when you have balance issues, you cut into that fun. Quality balance and good game play matters. A lot. You have the on-line version you could be using as a data gathering tool. You have the resources available to make changes and monitor their impact. You just have to care about the quality of game play. And about the "Boss List" and "Star Tier System".....those are both lame attempt to compensate for bad balance problems. STOP THAT!! Just fix the damn problem instead of trying to hide it with Boss lists and Tiered Teams. Just put some effort into fixing the balance. USE your on-line game as a tool to make the game better. You are artificially tying the physical game releases to the On-line game releases. Stop that. Use the on-line game to improve game play via using it's data to balance characters. Make changes as often as you need to accomplish this goal. This will keep the on-line game competitive and not have the Julith disaster we've had on-line for the last year plus. Once the online data shows that characters are well balanced....then and only then, do the physical game Eternal Pack update. You have the same access to data that LOL has. They are using it to improve game quality, you are not. Ultimately it's game quality that will make or break the game.